Remember when you were first learning to play the clarinet? Chances are, your first note was open G, bottom line E, or low C. Things were great (minus the inevitable squeaks) and all was smooth sailing until you reached middle B. I remember my middle school band director telling me that middle B was the hardest note to learn on the clarinet. At the time, I laughed inwardly as I breezed through the chalumeau register…..and then came to an abrupt halt as I approached the clarion register. From a young age, I learned never to doubt your band director. Why is middle B so difficult for beginners to play at first? There are several reasons, and it is impossible to pinpoint universal causes without consulting each individual player. However, I have taught dozens of beginning clarinet students over the years and have noticed a common habit and simple solution regarding middle B – the placement of your right hand ring finger. If middle B is not sounding properly or is squeaking, chances are, the right hand ring finger is not adequately covering the tone hole. This is especially commonplace among younger beginners, as their hands are still growing and their fingers are often too small to completely cover the tone hole. Make sure the pads of your fingers are covering the tone holes. If you are covering the tone hole closer to your first knuckle or using the very tip of your finger, you are allowing air to escape from the tone hole. As a result, your middle B will either squeak or not sound properly (or as one of my students described it, “Sound like a dying dinosaur.”). This is good finger position for middle B. Notice how the pads of the fingers are completely covering the tone holes. 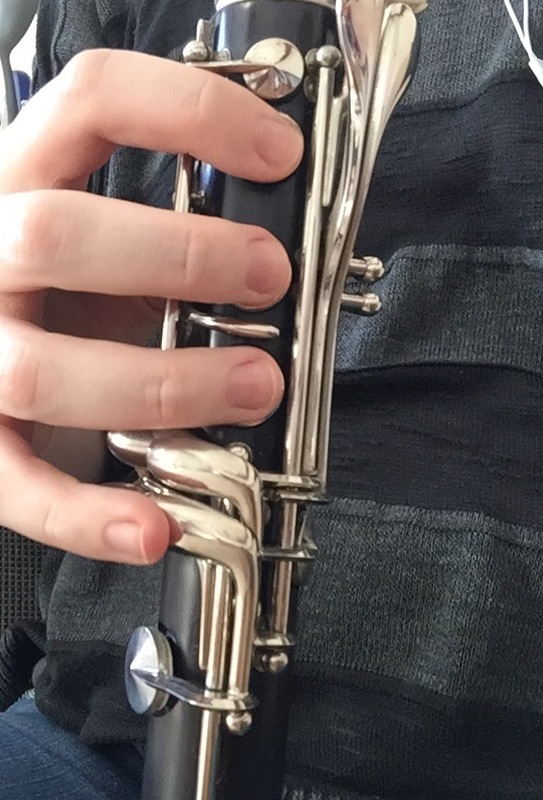 This is bad finger position for middle B. Notice that the right hand ring finger is not completely covering the tone hole, allowing for air leaks which may cause squeaks or prevent middle B from sounding. This is also a bad finger position for middle B. Notice how the fingers are all too far over (instead of using the pads of the fingers, it is closer to the first knuckles). This may also cause air leaks, causing the note to squeak or not sound properly. Be sure to check your own finger position, and if you are a private instructor or band director, this is simple and common fix for your students to easily play middle B. Happy Friday – have a great weekend, and don’t forget to practice! Thank you . I have suffered with this coming back to the clarinet, as you well kmow. You taught me this and it cured it – hard to remember to do all the time. Practice, right?